is simple calculator which works on the principle of BODMAS . So if we have to calculate 3 + 2 x 5 . We could either do a 3+2 first and then 5 x 5 or we could either do a 2×5 first and then 3 + 10 . How do we know what to follow ? This is exactly where BODMAS came to picture . It simply means follow BODMAS when doing such calculations . Answer to Above question could be either 25 or 13 . According to BODMAS it should be 13 because order of Multiplication comes first and then comes Addition so we multiply 2 with 5 first and then we add 3 with resulting 10 to give the final answer 13. By Calculator we mean a Simple Mathematical Calculator which calculates mathematical expressions and gives us result . For example 3+2 . We all know its 5 . But what about 232434 + 99238 ? Not that easy so we use a Calculator . Again What is BODMAS Calculator ? It is a Calculator which calculates mathematical operations following BODMAS Rule . 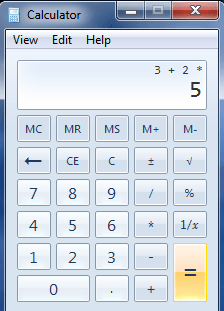 Why Should we use this BODMAS Caculator and Why not windows inbuilt calculator ? 3 + 2 x 5 should result in 13 using BODMAS and otherwise 25 . If you have any suggestions or any feedback or you are interested in the source code or learning how to code your own calculator you can always write to us via contact page .